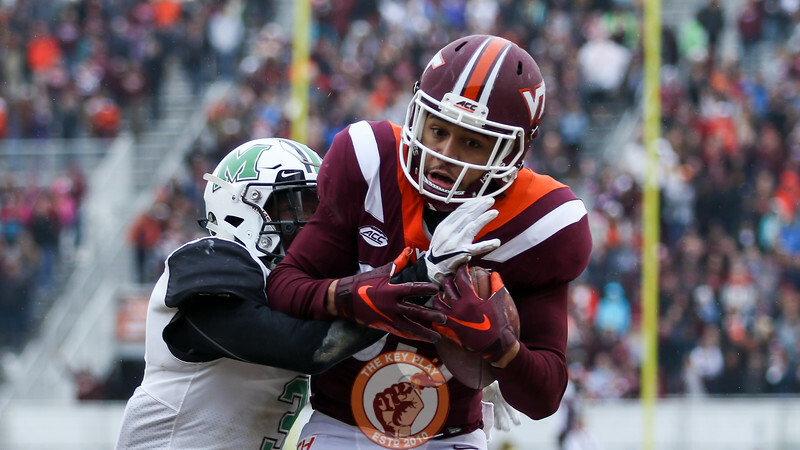 The Hokies earned their 6th win of the season last Saturday, a 41-20 win over the Thundering Herd. 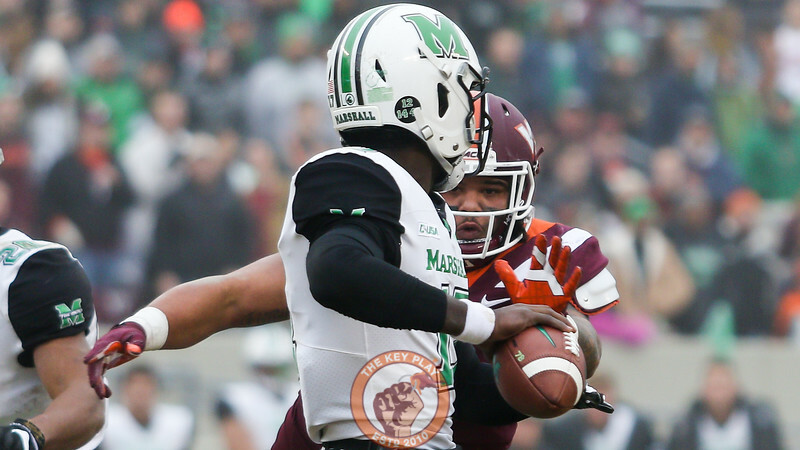 The make-up game against Marshall felt like the worst spring game ever before kick off. 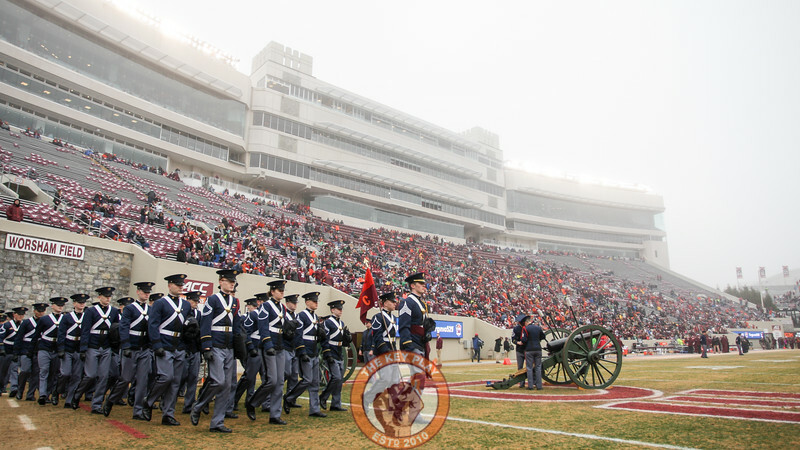 It was foggy, cold, and the crowd that did manage to make it to Lane on a week's notice had big shoes to fill to make it a normal game day atmosphere. Then the game actually kicked off and it was wonderful from the start. Usually you get a few plays to get into the rhythm of things, but Ricky Walker had other ideas. Luckily you could see it develop from my side of the field, which allowed me to better focus where the action is going to happen. 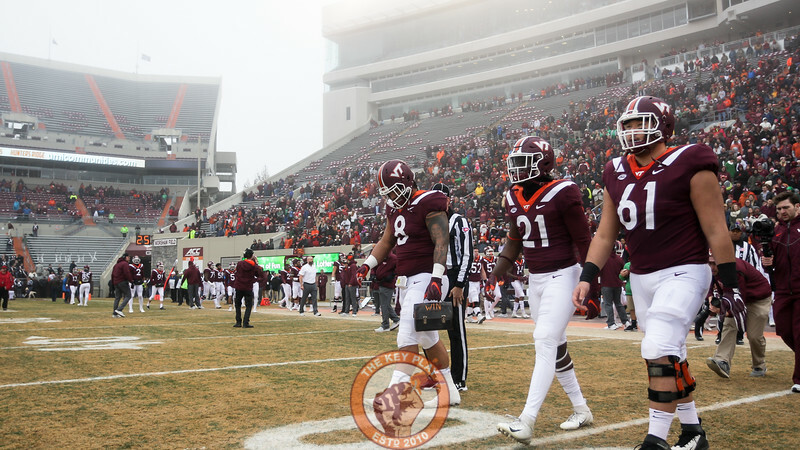 Other things that went well for me, Bryce Watts deciding to celebrate his first quarter interception by running down the sideline right past me. With the gear that I have, I don't have as many opportunities to get that really stereotypical football shot with the extra-bokeh that makes sports photos really stand out. When the action comes to you, or sits inside the 20-yard-line for most of the game, it really helps me create that look. Bokeh - /bōˈkā/ - noun - the visual quality of the out-of-focus areas of a photographic image, especially as rendered by a particular lens. 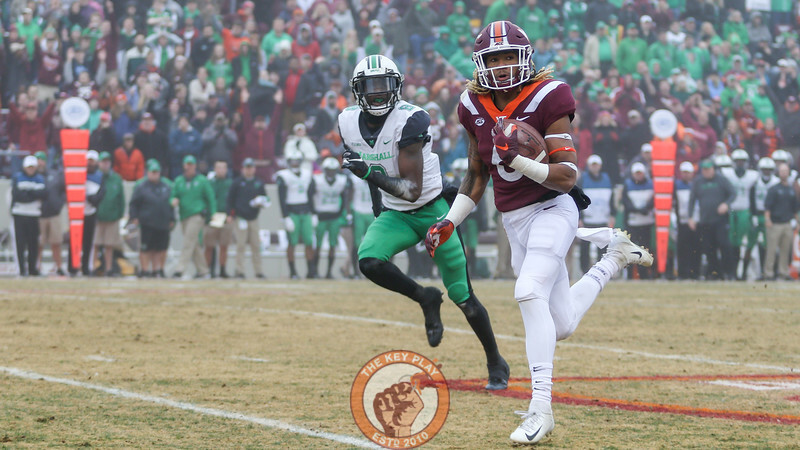 Hezekiah Grimsley's big catch and run also worked out for similar reasons. The catch happened 40+ yards away, but the run came within 10 yards and the celebration within 5 yards. I especially like the layering in the second one. Other views that felt like hitting blackjack include this shot of Ricky Walker almost crushing Marshall QB Isaiah Green before a pass. Staying on the eyeball theme, Eric Kumah's long touchdown grab is probably my favorite photo of the game. It's extra sharp, the background is clean, and the faces are great. From a pure action perspective, this run from Steven Peoples takes the cake. 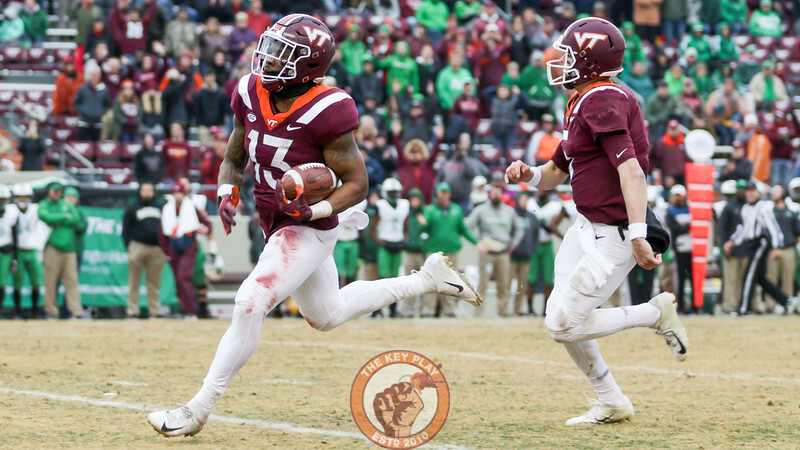 The run itself wasn't anything special, but little moments like this happen in every single play during a game, and most go unseen and unremembered. 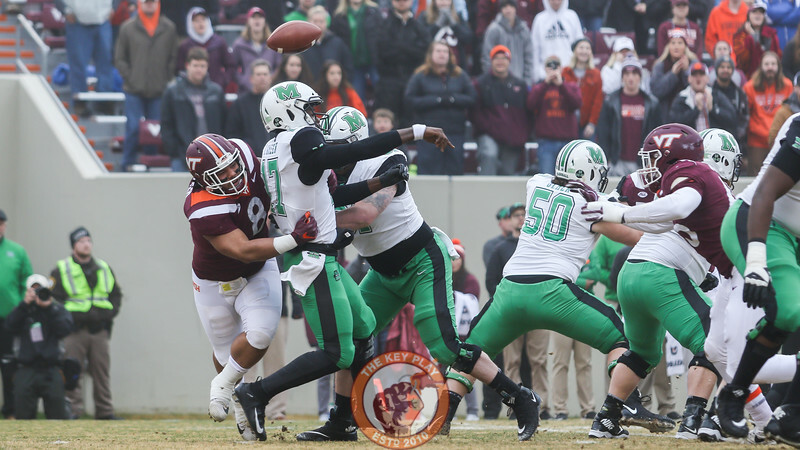 Here's a moment where Peoples almost looks like he's reverse-punching the poor Marshall player attempting the tackle into missing. I'm going to be honest, I have no idea, but the Corps of Cadets remain one of my favorite subjects to photograph. 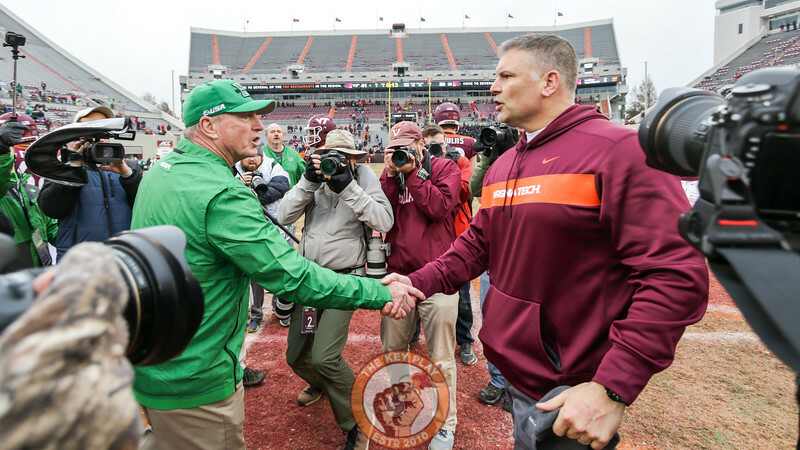 I'll end with this photo of Fuente and Doc Holliday shaking hands at midfield. I haven't shot with my 10-22mm as often as I normally like to this year, but because the game was well in hand by the end, I decided to switch a couple minutes early from the 17-40mm that normally lives on one of my two cameras during regular game action. The 10-22mm is easily my favorite lens of all time because it just can fit so much action into the frame while keeping everything tack sharp. You can get a sense of how close-in the coaches handshake feels when surrounded by the press scrum with only a hint of what's next to me with a lens this stupid-wide. 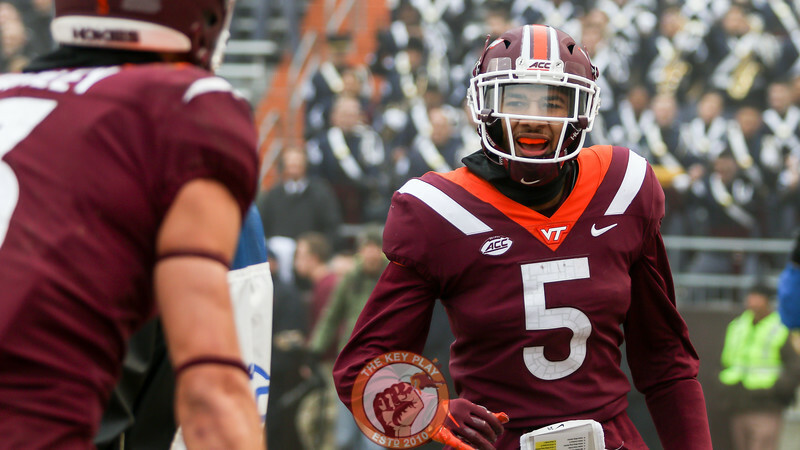 You can check out the entire game's photo gallery here and every game covered by TKP at photos.thekeyplay.com. See you all in Cassell next! Great pics. The bokeh was great! It really adds super intensity. Well done. Dude, amazing work. Extremely well done! That 10-22, is it a Canon? I'm assuming you are shooting a crop body Canon on that shot, but I admit I didn't look for exif data. I have the Sigma 10-20, but finding it's not always as sharp, especially in the corners as I'd like. I have the same Sigma. I've never really noticed issues around the edges, but I also usually some automated adjustments in lightroom to account for the lens profile. Thanks! I shoot Canon, yes. The 10-22m is an EF-S crop only lens, but otherwise is equivalent in quality to the L series. several times trying to figure out what you really meant to type before getting past the picture to the definition. Awesome Photos! I'm wondering if you sell any of these? 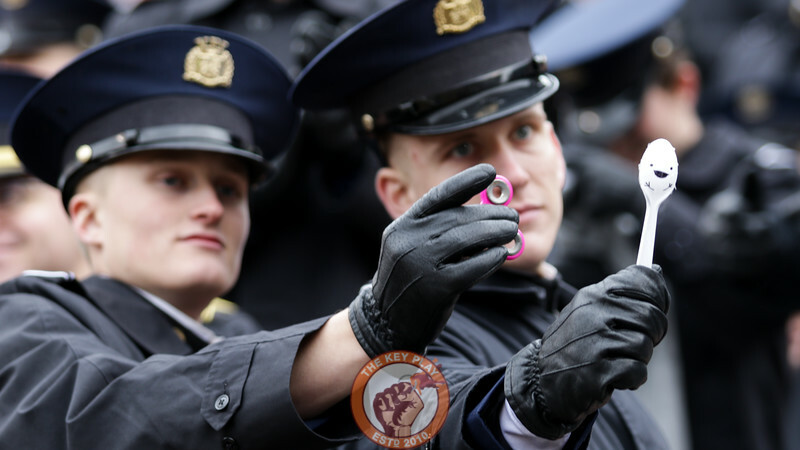 "The Cup is going NOWHERE Mikey!" That last photo - Exactly how close were you (probably in inches) from the coaches? Ha! Got my spoon. Need a bowl! 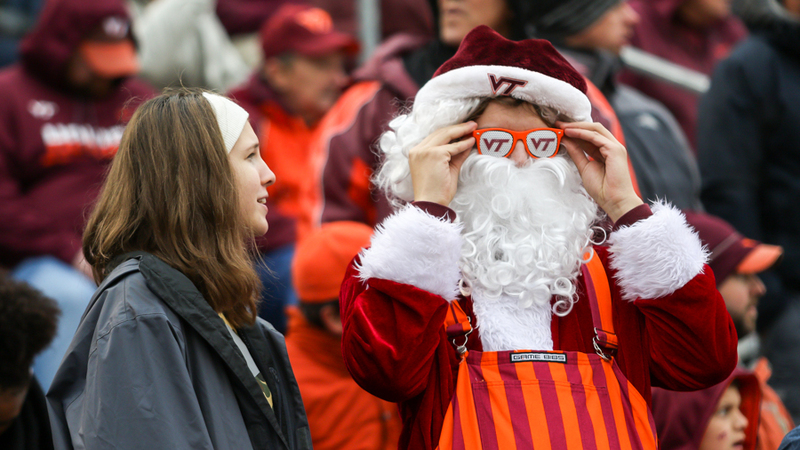 So fitting that the first photo in this photo gallery is that of "Santa" - this game was just the gift we needed. Good call. 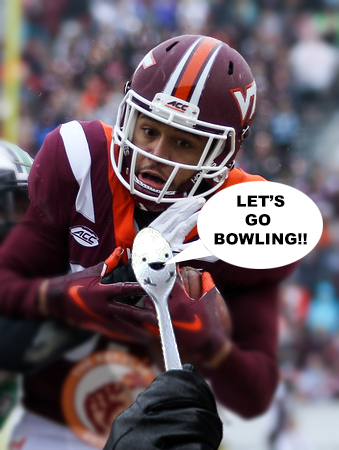 It then begs the question: If Hokie Santa gifted us this game, who helped us with the UVA win? 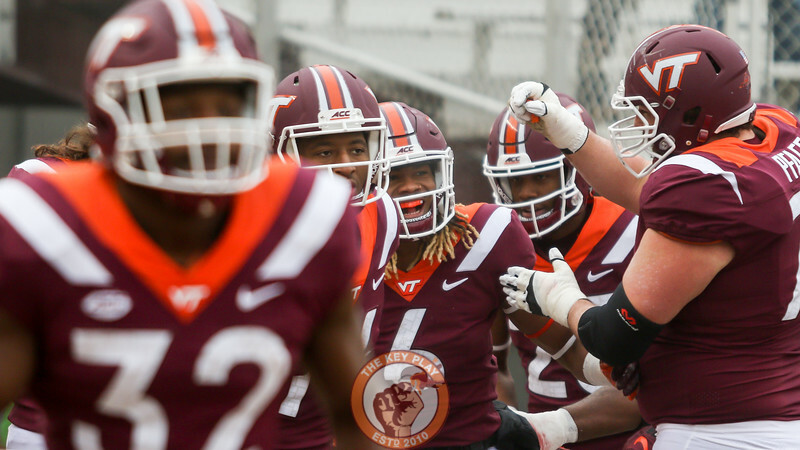 Must have been Hokie Hanukkah Harry because the UVa game had about eight little gifts in it.. I made a comment on Reddit asking someone to leave a milkshake by the Beamer statue as an offering to the legend that started it all. I'm still under the assumption someone did that. It's the only thing that makes sense with how those fumbles fell. Holy crap! This needs to be a new tradition! Imagine every home game there are hundreds of milkshakes placed at Franks feet. heup may be onto something, but I also maintain my theory that the ghost of Hunter Carpenter inhabits the south end zone. Coincidentally, I watched highlights of that game earlier today. The infamous stomping game. I've seen our defense knock QBs out of games before, but never have I seen us lay an unholy hurting on somebody like we did that kid. He's probably still sore. The gauze packing flying out his already broken nose should be a well used gif. Major QB beat down in that game.